Sophisticated and perfectly on-trend, you’ll be falling in love with the Melrose Midi by Pasduchas! 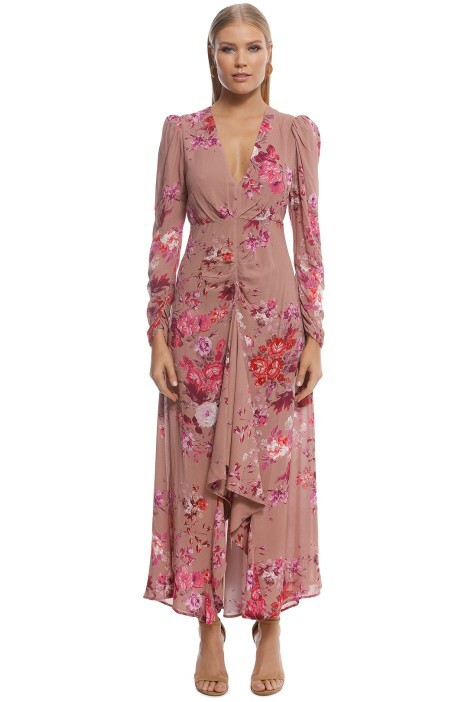 The floral midi dress is accented with a plunging neckline and long sleeves with puff details at the shoulders. With elegant draping on the skirt and a high-low hemline, rent the stunning dress for an engagement party or a spring wedding. For an elegant wedding guest outfit, pair the dress with coordinating blush strappy heels and hire a light gold mesh pod for your evening staples. Check out our blog post on spring guest outfit ideas to try! Melrose Midi - Cinnamon is rated 5.0 out of 5 by 2. Rated 5 out of 5 by Anna from Stunning dress! Perfect for Autumn garden wedding. This dress is true to size - I rented the 14 - it was the perfect length and fit through the bust. If you have a bigger bust like me it is a little revealing in that area! The long sleeves make it perfect for that Autumn/Winter occasion. The colours are divine, perfect Autumn tones. I love how the dress fell from the waist - so stunning. Rated 5 out of 5 by Marina from Feminine and pretty dress Such a beautiful and feminine dress. I didn’t wear it as it was a warm evening, however with the change of season I will definitely rent this again!! I loved this length too.